I walked out of the library and passed One Boy to the resident first grader sitting in the backseat who, in his mind, has become quite a book critic, not afraid to speak his mind. After a few minutes I asked, "Whadja think, bud?" "I didn't like it at all." Well, so much for the critical review. That night before bed, however, we read it together. Each page has cut-outs revealing part of the next page's illustrations (think Joseph Had a Little Overcoat or The Very Hungry Catipillar). Guess who was trying to remember what was on the next page based on the little bit that was visible? "Wait, wait, wait! Don't turn the page yet!" The cut-outs reveal part of the illustration on the next page, but after the page is turned, they also leave part of the previous page's text visable. These still visable letters become part of the next page's text. Again, guess who, after he understood how the cut-outs worked, was trying to guess what part of the text would reused on the next page? We'd read "SEVEN CANDLES," and I'd hear him murmer, "Candles...candles." He'd think some, then continue, "...andles...can...cand...AND!" We'd turn the page and sure enough, "AND A CAKE." 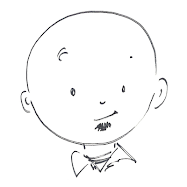 The book begins with "ONE BOY." The next page shows him seated, seemingly bored, and "ALL ALONE." The word ONE is now part of ALONE. Later we read "THREE APES" followed by "BIG ESCAPE." This time APE becomes part of ESCAPE. At the end, "ANTS" becomes part of "PANTS," but I'll leave the visual and context of that one to readers. So, yeah, apparently the boy didn't like it. He didn't like it so much that he told me when to turn pages and was guessing and predicting on each page. 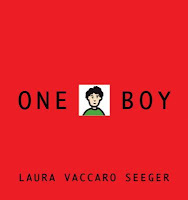 Congratulations, Laura Vaccaro Seeger, on writing a thouroughly...eh-hem...unenjoyable book.